Revolution Slider Error: Slider with alias dcfc-static not found. Cinos are incredibly proud of their association with Derby County Football Club and wish Steve McClaren and the team all the best for the Championship playoff final. After Derby’s fantastic season, The Barclays Premier League would be a fitting end. Win or Lose Derby County and Cinos have already committed to major investment next season with a complete overhaul of the Sky Broadcasting Box which will now be known as the Cinos Suite. New technology and innovation will showcase Cinos as Derby County’s Audio Visual Partner and we look forward to the first televised game next season when the world will be watching. If you would like to keep up to date on renovations for the Cinos Suite please enter your details in the form provided on this page. If you would like to learn more about Cinos, please click here. 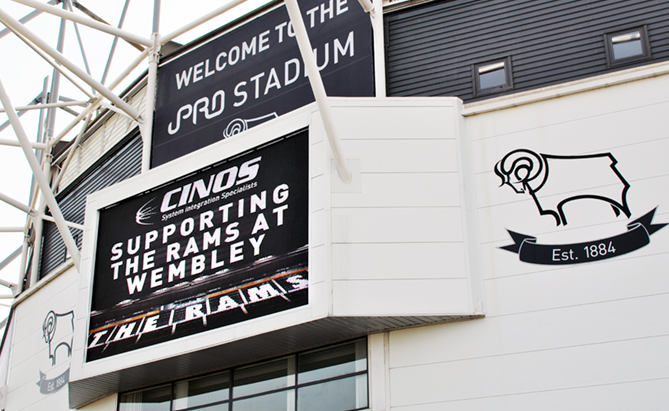 From all at Cinos – come on The Rams!! !